Top: bushy-backed nudibranch photographed by Chad Tamis. 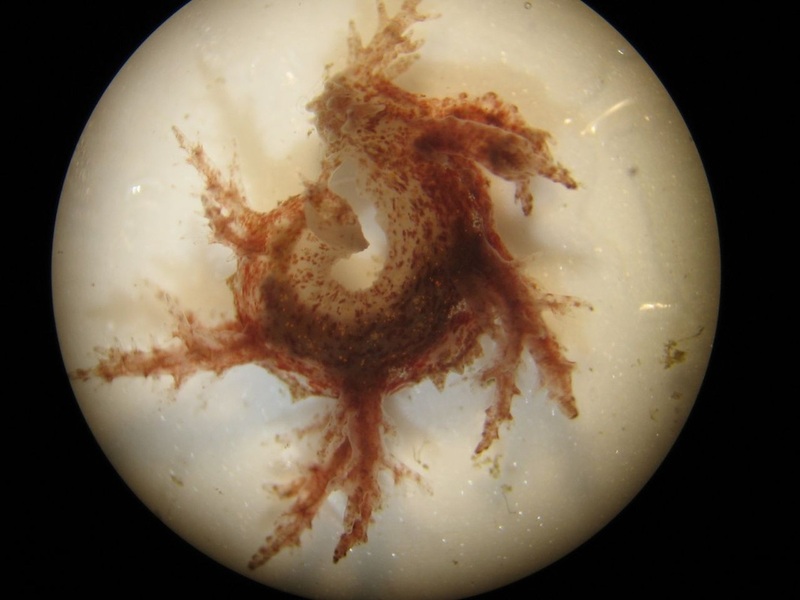 Bottom: a juvenile bushy-backed nudibranch, measuring less than 1 cm long. Photos by Kelly Fretwell. 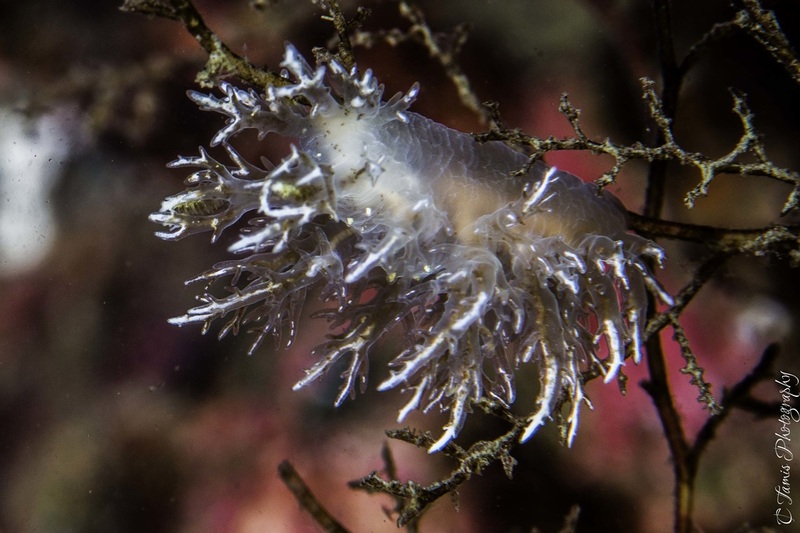 Like the other species in Family Dendronotidae, the aptly-named busy-backed nudibranch has many branching tufts projecting from its dorsal side. The rhinophores — two antennae-like sensory projections at the head of the animal — are branched, as are the cerata (gills) that cover its back. 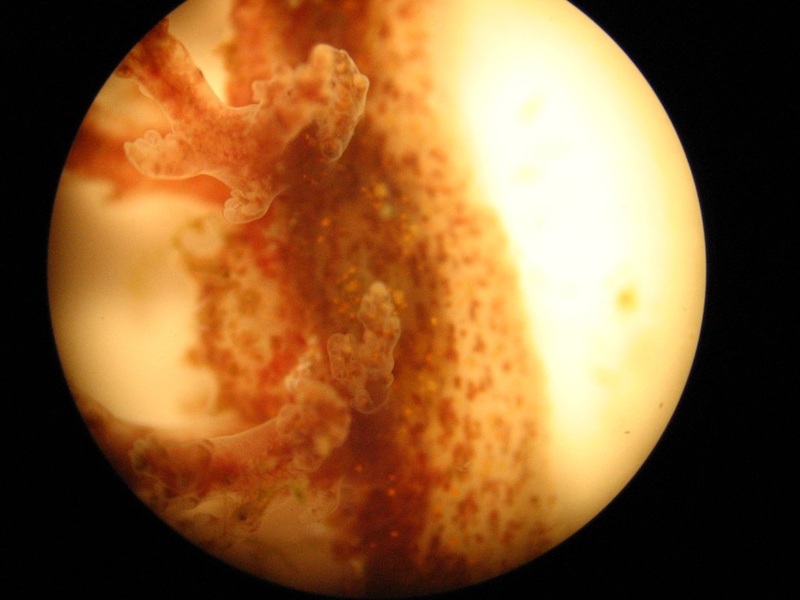 A key identifying characteristic of this species is the presence of a lateral branch (itself divided into branches) projecting from near the base of each rhinophore stalk. This species' colouration is highly variable, and can be influenced by factors such as age and habitat. Juveniles, measuring 4-30 mm long, have more vivid colouring and are more patterned, while adults are paler and any patterning that occurs is less prominent. Specimens found at depths below 25 m tend to have paler colouring as well. This species can reach 10 cm long, with northern bushy-backed nudibranchs reaching larger sizes than their southern counterparts. This species can be found in intertidal and subtidal waters, to 400 m deep, from northern Alaska to northern Mexico, though it is more common to areas in and around the Atlantic Ocean than the Pacific. It can be found near and among hydroids, upon which it feeds. Its "bushy-backed" appearance can make this species difficult to spot amongst similarly tufted and branched hydroids. Dendronotids as a group bear many branching cerata, and many have branched rhinophores similar to those of the bushy-backed. This means that a number of species may confused with the busy-backed upon first glance. However a close inspection of the rhinophores—looking for the branched lateral processes—should yield a correct identification. *Until recently Dendronotus venustus specimens were described as D. frondosus, a European species. Taxonomists determined Pacific individuals to be morphologically and genetically distinct from their European counterparts and so resurrected the name D. venustus, which was previously applied for this species before it was synonymized with D. frondosus. 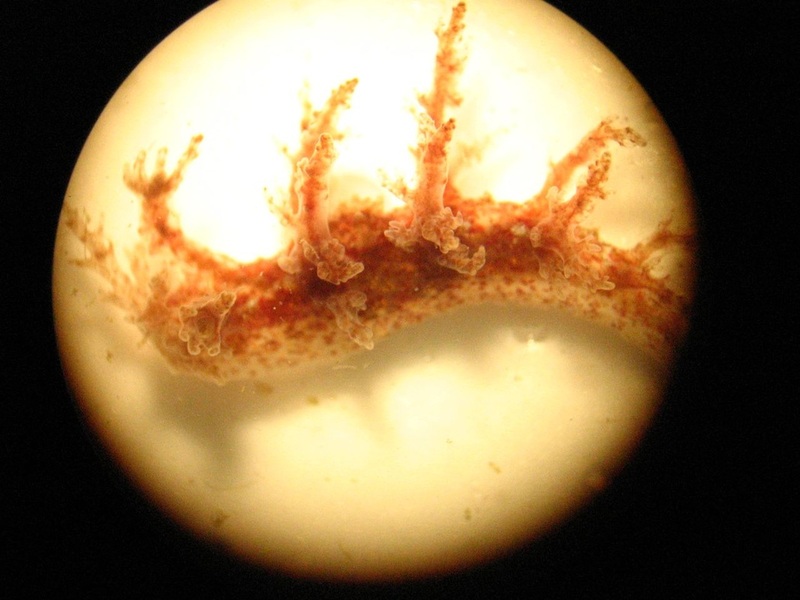 The rhinophores at the head of the animal can serve a similar purpose as the rings of a tree trunk: more rhinophore branches and increased complexity of branching indicates an older individual. While this nudibranch, like many others, can't actually swim, the narrow tail end of the nudibranch can be used to wiggle-swim away from predators in a last-ditch escape attempt. Dendronotus frondosus. Mollusca of the North Sea. Marine Species Identification Portal. Accessed 06/06/2013. Lamb, A., and Hanby, B. (2005). Marine Life of the Pacific Northwest. Madeira Park, BC: Harbour Publishing. P. 263. Stout, C.C., Pola, M., and Valdés, Á. (2010). 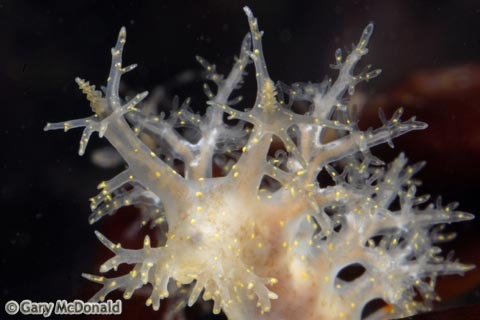 Phylogenetic analysis of Dendronotus nudibranchs with emphasis on Northeastern Pacific species. J. Mollus. Stud. 8:1-9.